You're able to poison iron/steel/mithril/adamant/rune bolts but then c'bows don't recognize their (p+) version. You can't poison only 2 types of bolts - bronze and ancient. "I can only poison arrows, darts, javelins, daggers and spears." Demon wand and orb after losing them on death turn to regular form with 30k charges. Other Demon weapons and Torva work fine, they become broken. 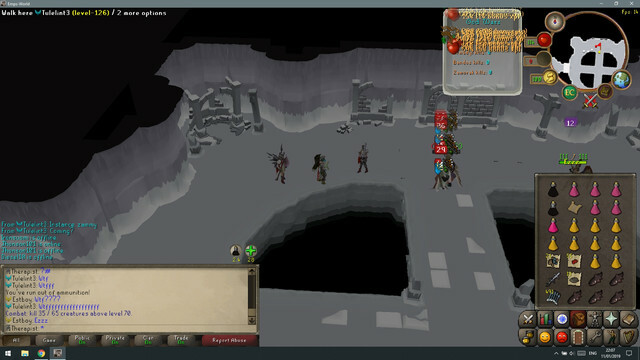 Selling runes from main account to Aubury and then buying it back with Ironman. Is this ok or not? Noticed this like a year ago so its time to report it. I guess nobody ever uses forums on their mobiles but you cannot search anything on mobile through forum search bar. I'm getting attacked by Saradomin minions while wearing Sol. Hello, again not sure if it's a bug or not, but I lose charges every time I get hit by a monster as well as losing charges from poison. Haven't tried it with other Auras. would be nice to see this kind of table in guides section so we can plan our XP/levels efficiently and not leaving Emps website.